In the old days, wooden buildings existed under a constant threat of fire, and Swiss chalets were no exception. While modern materials and techniques have essentially rendered fires a thing of the past, there used to be a time when conflagrations posed a constant threat that often decimated villages with a single blow. The world-famous resort village of Grindelwald suffered such a fate on August 18, 1892. A fire swept through the tiny Swiss village and destroyed an estimated 50 buildings, nearly half the town at that time. An article published by the New York Times on August 19, 1892 described the scene. Embers from the burning structures were carried a long distance, and a number of chalets miles away from Grindelwald were set on fire. When the fire broke out, the tourists stopping at the Hotel Baer devoted themselves to saving their luggage and valuables. When their property was secured, they joined the villagers and the guests from the other hotels, and together fought the fire. A bucket line was formed and water was passed along as rapidly as possible, but the flames had gained too much headway to be subdued by this means. The village is a straggling one, and it was due to this fact alone that it was not entirely destroyed. The above photo shows one of the buildings that survived the fire. Note the metal roof in the upper left hand corner. Metal roofs were a notable advancement in fire prevention and suppression during the 20th century. 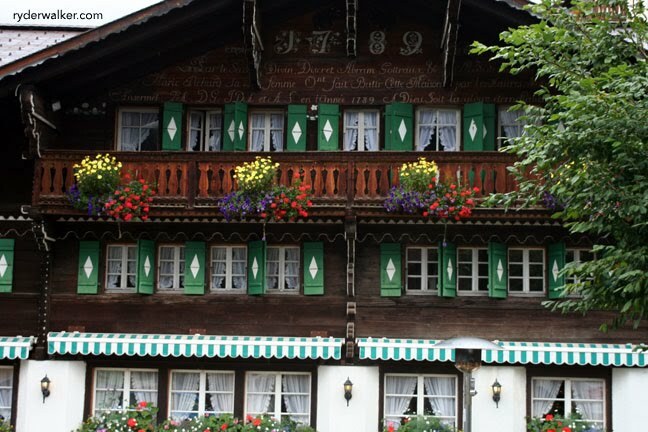 Built in 1789, this cozy Swiss chalet represents one of the oldest buildings in central Grindelwald. It’s seen political uprisings, the ravages of fire, two world wars, an era of space exploration, and more. Like a wise old tree that weathers the sands of time, she stands watch as generations come and go. Today, this Swiss icon provides a home for weary travelers and maintains the charm of days gone by. With a cozy bierstube, sunny decks and unobstructed views of Switzerland’s most distinctive peaks, it’s our preferred resting place when hiking between Interlaken, Wengen, Meiringen and beyond. Don’t be dissuaded by its age, however. While the old house endures, a sophisticated, three star contemporary addition offers discerning travelers every amenity. Image: One of the oldest hotels in Grindelwald. I could appreciate a beautiful living room like that, when it's snowing outside.